If you’re not familiar with Rodial’s products, you probably thinking im talking about some crazy Game of Thrones themed skin care. Famous for their Snake and Bee Venom, Rodial have always been there on the forefront of beauty trends and innovations. I am a HUGE fan of both their skincare and the makeup, I mean Kim Kardashian uses the contour powder I posted about a few months ago, I am obsessed with it, and their Stem Cell Booster Oil is just magic! Apply it under your makeup and it gives your skin an incredible glow and it instantly smooths out wrinkles giving you a flawless complexion. The latest products I want to tell you about from Rodial are the two I tried on my trip to New York a few weeks ago. They completely saved my skin from dehydration and boosted it with moisture to reveal flawless and radiant skin. You must be wondering why I am telling you now? Well, these two masks will 100% get you through the winter and keep your skin looking and feeling soft, radiant and wrinkle free. It was my first time in New York so I wanted to look my skin to look amazing and was really worried about the affect the long haul flight would have on my skin. I needed something that would defy the lack of oxygen, humidity and air con and boy this Dragon’s Blood Hyaluronic Mask did that both ways and so much more! It contains hyaluronic acid which is the super ingredient that the beauty world is still obsessed with. It is kept my skin hydrated and plumped out all my tired lines and imperfections. The mask contains Dragon’s Blood (the spa from the Croton Lechleri tree) to reduce redness and inflammation so I can assure you, no dragons were harmed to make this. Other ingredients include Hydromanil to firm, refine and soften dehydrated skin. Gransil to rehydrate, correct skin tone and plump the appearance of fine lines and wrinkles, a skin plumper with 3D filling spheres and LaraCare to stimulate and mildly exfoliate. The gel is really light and feels really cooling on the skin. Apply a thick layer and remove after 10 minutes if you’re in a hurry, but I would recommend applying a thin layer over night. You will wake up looking plumper, younger and your skin will be softer. I love the bright packaging and the scent is pleasant. The gel itself doesn’t weight down or feel uncomfortable on the skin and if you’re luckty emough to be travelling this winter, it comes in a size that can be taken as hand luggage. 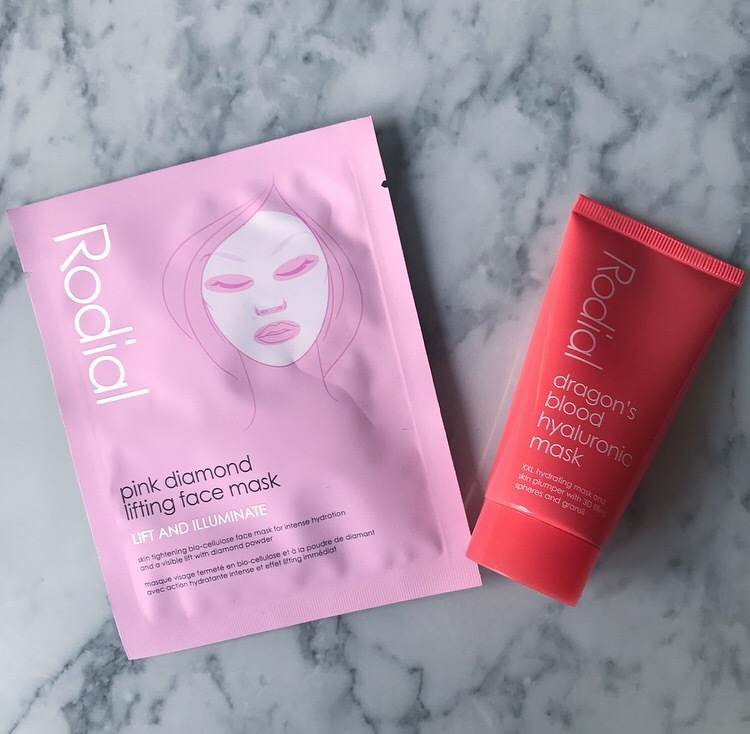 If you like a sheet mask, you will love this Pink Diamond Instant Lifting Face Mask which is a pink second skin likeand kind of strange mask that will brighten, hydrate and make your skin skine bright like a diamond! This mask comes out of the wrapper covered in two sheets so don’t do what I did the first time and only remove one sheet and apply on the skin. I thought it was like a Korean sheet mask and was wondering why there were no cut marks to fit the face. After about 15 minutes I realised that I needed to remove both sheets to reveal a sticky, gel like pink mask. I applied again and waited 10 minutes. The mask doesnt slip and stays in place be perfectly moulding around the face. It stays cool and only dries up when its ready to be removed which is after around 20 minutes. Once removed, continue with your normal skincare. You will notice how amazing your skin will feel. My skin after my flight was SO soft and hydrated, it was glowing like crazy! I actually didnt need makeup at all. In fact, there were a few days I went makeup free… something I never do in London but sriously my skin looked so amazing and illuminated. The way it works is the bio-cellulose face mask acts like a cooling second skin, whilst the fibres instantly lock moisture into the skin and enables a deeper penetration of the formula. The mask itself is infused with pink grapefruit, actual diamond powder and skin-tightening peptides to instantly lift, tighten and brighten skin for a more youthful looking, radiant complexion with lifted facial contours. Its so amazing I have to stop myself finishing the box too quickly. Unlike many masks, the glowy feeling and look lasts for a really long time and I believe these will get you through those dull winter skin days. Use the mask day or night on clean skin. Rubthe closed packet, remove mask and BOTH sheets and apply tto the face. Remove after 20-30 mins. Here’s me and my mask, lol, sorry, I didn’t mean to scare you!